At RAMUC, we began formulating aquatic paints and coatings in 1934, with one clear goal in mind: to create products that would exceed our customer's expectations. Today, we are proud to have risen to become a leader in the industry. Our products are in use everywhere, from major water parks and resorts, to backyard pools and fountains. In over 70 years in the business, we have expanded and perfected our products to offer everything you need to maintain and beautify all your aquatic fixtures. We offer epoxy based, rubber based, and acrylic pool paints; deck coatings; and cleaning, prep, and ancillary products. Each has been carefully developed and tested, and conforms to current industry standards. We continue to add to our line in response to changing demands; for example, this year one of our newest products, Ultra Pro 2000 Low VOC Rubber Based Pool Paint, was honored with second place in the Best New Product category of this year's International Pool, Spa & Patio Expo. Our product line isn't our only focus; we continue to uphold our unwavering commitment to customer satisfaction. Our skilled professionals are ready to be at your side every step of the way – from discussing your vision, to identifying what to use and how much to buy, to offering step-by-step advice on use. Whenever your aquatic fixtures are in need of update, please keep RAMUC in mind. 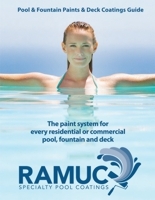 Call us or visit our website, www.ramucpoolpaint.com, or order our full color catalog to leisurely browse through our selections. Founded in 1934, RAMUC has developed an extensive line of trusted, proven specialty coatings products for beautifying and maintaining pools, aquatic fixtures, and decks. Whether using epoxy, chlorinated or synthetic rubber, or an acrylic finish, RAMUC has a superior line of coatings and accessories to safeguard the aquatic structure and achieve a spectacular result. In addition to upholding a top-quality line of products, RAMUC maintains its commitment to customer satisfaction as a primary goal.